Sat., Oct. 27, 2018, 4:12 p.m. The opening weekend for the general deer hunting season was good, according to Washington Department of Fish and Wildlife biologists working at hunter check stations in Chewelah and Deer Park. Hot and dry weather the following weekend, however, kept many hunters at home and made hunting difficult for those who did venture out. On opening weekend Oct. 13, WDFW hunter check stations at Chewelah and Deer Park recorded hunter success. In Chewelah, 49 hunters stopped. They brought in eight white-tail deer (two buck and six does) and two mule deer bucks. The Chewelah station also saw two cougars and two turkeys. In Deer Park, 127 hunters stopped. WDFW officials checked 35 white-tails (24 bucks and 11 does) and three mule deer bucks. For comparison, in 2017 174 hunters stopped in Deer Park checking in 25 white-tails and three mule deer. The hot weather makes it hard to gauge overall trends in deer population, Prince said. The late deer season runs Nov. 10-19 in most of Northeastern Washington’s game management units. Prince believes fewer people stopped at the Chewelah check station because it’s new. “They maybe didn’t know what was going on because they had never seen one before,” she said. Check stations are one of the main ways WDFW can gauge hunter success. Prince urged everyone to stop, regardless of whether they got an animal or not. “That’s our biggest face-to-face with people to get to know what’s going on out there,” she said. For first-time successful hunters, stopping at a check station could mean a nice reward. Starting this year, WDFW gave certificates to first-time hunters who successfully bagged a deer, regardless of age. On opening weekend, Joey Anglin, 11, of Spokane Valley, bagged his first deer. 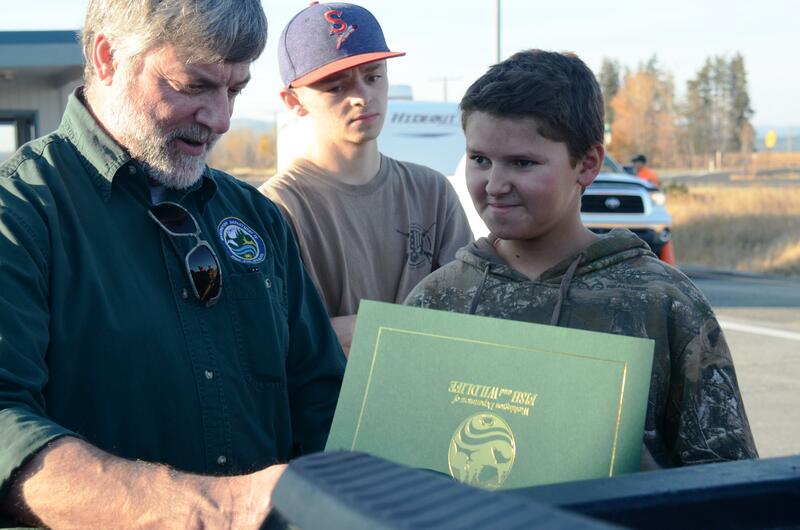 When his family stopped at the Deer Park hunter check station on Sunday, Steve Pozzanghera, WDFW’s Eastern Region director, awarded the Spokane Valley hunter a certificate commemorating the milestone in his hunting career. Young hunters were not the only ones who appreciated the new program to honor new hunters. Published: Oct. 27, 2018, 4:12 p.m.